Tormek has just introduced two new stones for their sharpening system to deal with the problems of faster stock removal and finer surface finish. I have been a fan of the Tormek sharpening system for some time now, but it has always been used for the final sharpening process. The initial grinding and reshaping of the edge is better carried out on a dry grinder as it is so much quicker than using the standard Tormek stone for significant metal removal. However, I am not entirely happy with this arrangement as dry grinding has the potential to damage the tool and is so much less controllable. true from new but it actually ran spot on - very impressive. Cutting performance was exactly as claimed, extremely fast, but very controllable with the various jigs and of course no chance of overheating. You can press as hard as you like and the wheel just keeps cutting. The finished surface has obvious grinding lines but you can use the stone grader to dress the stone down to 1,000 grit for a finer finish as you would with the standard stone. I was a little nervous when it came to using the SJ 250 as it appears to be so soft, but it too works really well and although it doesn't feel as if it is doing anything it very quickly produces an amazing polished surface. It doesn't really remove much metal, but polishes, and is so much more accurate and precise than using the leather honing wheel. The stone apparently needs regular cleaning with the supplied dressing stick, but I can see that it will be needed soon. 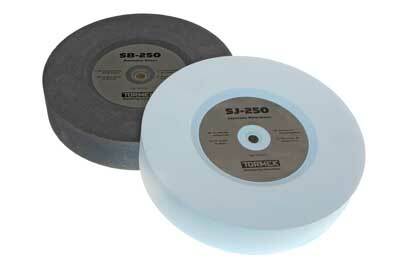 The SJ 250 is also available in 200mm (8in) diameter for the T3/1206 machines. Both these stones do exactly what they say and cannot be faulted, just as you would expect with a Tormek product. My main concern is having to keep taking them on and off the machine for each of their different purposes. Neither of them gives you the complete sharpening process in one and the machine was not originally designed for regular swapping of stones. 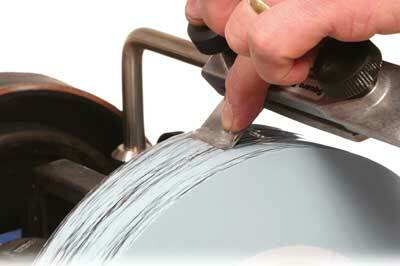 If a tool is badly damaged it is going to be a long-winded process working with at least two different stones. However, as I feel the leather wheel is now unnecessary, perhaps we shall see a double-ended Tormek soon; that would be the ultimate. The other issue is the price. These are very expensive stones, particularly the Japanese one, but if you want a perfect edge straight off the stone with all the Tormek precision this is the price you will need to pay.